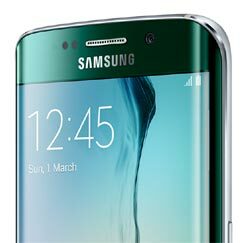 In a nutshell: Just when you thought all smartphones looked the same, the Samsung Galaxy S6 Edge brings a fresh new look. Featuring a double-edged curved screen with special edge display features, it's one of the best-looking phones you can buy. It's also super-powerful, with an 8-core processor, outstanding cameras, plenty of memory and the latest Lollipop flavour of Android. But make sure you're sitting down before you look at the price! The Samsung Galaxy S6 Edge is the version of the Galaxy S6 that everyone really, really wants. Pity it's so darn expensive. Is it worth spending an extra £100+ to get your greedy paws on this beauty? S21 checks it out. The Edge is all about design. Design is why the Edge exists. Why make a curved screen? Because Samsung can, and because it looks stunning. To say that the Edge is all about the screen is an understatement. The screen dominates the phone in a way that we've never seen before. Is this the future of all phones? We'd love to think so, because it's quite mesmerising. The Edge is all glass and metal - curved Gorilla Glass 4 on the front, flat glass on the back, and aluminium alloy on the sides. It's a very beautiful and tactile finish, and we want to hold it and stroke it gently. It's mine, you see. My precious. The curved screen is not just cosmetic. It also adds functionality to the phone. The curved edges of the S6 Edge can display the date & time and a weather report, and flash alerts for emails, texts and calls. You can also set up 5 key contacts, each with their own colour code. The edge of the screen will then light up in that colour if that person calls. The contacts are easily accessed by dragging from the edge towards the centre of the screen. It's fun, it's useful, and we like it. You also have the option to choose between left and right as the edge screen to display information. We discussed the quality of the screen in our review of the Galaxy S6. We pointed out that it's the best screen currently available, with a stunningly detailed 1440 x 2560 pixel resolution, vibrant colours and almost perfect contrast thanks to Samsung's AMOLED tech. The screen is the same here, but better. Because it's curved. We already told you that. The S6 Edge isn't quite as slender as the S6, but at 7mm thickness, that's irrelevant, because it feels slimmer and it's even lighter than the S6. The metal and glass construction projects a premium aura, and if it's wow factor you're after, we refer you to the curved screen, which we may have already mentioned. The one thing we don't like about the S6 and the Edge is the way the camera sticks out at the back. Question: does the Edge look better than the standard S6? You bet! Does it look better than the iPhone 6 or HTC One M9? Um, not sure. The three phones have quite different looks and you'll need to decide for yourself. The Edge comes in a slightly different choice of colours to the S6. The choice is Black, White and Gold. 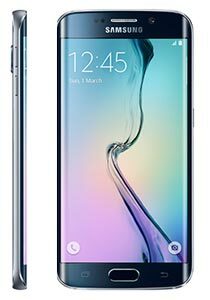 The only things that are different are that the S6 Edge is available only in larger memory 64GB and 128GB versions, and it also has a slightly larger battery. Both of these are very welcome improvements. 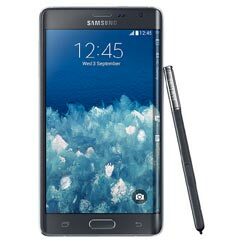 The 64GB Black and White versions of the Edge will be released on 10th April, just like the standard Galaxy S6. The Gold version is scheduled for 1st May. The 128GB models will come later. As for pricing, well hold onto your hats, because you should expect to pay somewhere around £50 per month on contract to pick up one of these beauties. At S21, we're shallow. We like the way things look, and we like the way the Galaxy S6 Edge looks. But we're also cost-conscious. We hate wasting money on things that don't work well or aren't worth it. And that presents us with a problem in deciding how to rate the Edge. On the one hand, it's obviously a nicer phone to own than the standard S6. It looks better, it does more, and it comes with 64GB of memory instead of 32GB. That seems to justify the price. On the other hand, £50 per month for a phone is way over the top. We've criticised Apple many times for charging that kind of money. On balance, we've decided to give the phone a 5-star rating. It costs the same as the iPhone 6, it looks (arguably) just as nice, and it has vastly superior technology - a better screen, more memory, a better camera and a faster processor. So yes, given the choice, we'd opt for the S6 Edge instead of the S6. What is the SAR for the Galaxy S6 Edge in New Zealand? Well this is my third Samsung smartphone and I can say the S6 Edge is easily better than the S2 and S4. The battery life was a problem at first but than the power save mode does prolong your battery life and you can easily get a full day out of it without recharging. The one thing I really enjoy is the multi tasking on the phone. The speed at which the phone works is very impressive too. Physically the Gold S6 Edge is much better looking than the IPhone 6. The new metal design from back and front give it the class that previous S series phones lacked. Definitely recommend it to anyone looking to buy a new phone !! Have had the 128gb edge in gold for a few weeks now and absolutely love it. As previous reviewer said, the battery takes a few charges to get up to speed but now lasting really well and with the fast charging doesn't take long to top up after a heavy gaming session. The screen and camera are amazing too. Great phone. I went for the dark blue and it looks stunning. I'm particularly impressed with the screen which definitely lives up to the hype. Applications are extremely quick and responsive on it. Fast charge is really handy. Regarding the comments re battery life, I have had my edge for a few weeks now and the first 8-10 charges didn't seem to last that long at all and it only just made it through the day. Now though I regularly have 40-50% left after 15 hours use which includes maybe 40 minutes of calls, some texts and FB browsing, and 2-3 hours listening to Spotify... Be patient! The battery takes some time to get up to speed but once it does its very good indeed. Very nice phone...looks great and feels awesome to hold...super fast like most other phones on the market now...but why oh why did they spoil it by not adding a slot for extra memory! and what about the battery life! yes...it is ok but not great (hence the 4 stars) and when comparing to my wife's Sony Z3 (which is amazingly awesome) I think I will be ready for a change when Mr Bond previews the Z4 towards the end of this year. Received my S6 edge on the 13th April (much earlier than expected). First impressions of the phone is that it just looks and feels exotic. The previous Samsung phone that produced this WOW factor for me was the Tocco Ultra. But this is on another level. It truly has an amazing look and feel. Aside this, the phone is very fast (for now) and has a solid OS in Android 5.0. The only concern I have is the battery life, which is good - but I always feel as if the battery is depleting rather quickly even when in Standby mode. Obviously the Fast charge is the solution from Samsung to this particular issue. Best phone I've had so far (much better than iPhone 6 Plus)! Received this phone on release day,10th April. I'm so glad I cancelled my HTC ONE M9 order and waited on the S6 EDGE. it looks beautiful, feels beautiful and has the best spec of any phone currently on the market. I'm so glad Samsung decided to ditch the plastic of previous models. You know you are holding a top quality product with the EDGE and with the 64GB memory a lack of memory card slot is not an issue for me. and the super fast charging time means a 15 minute charge can give you 4-6 hours of use. I can definately recommend this handset and congratulate Samsung on finally catching on to the fact that their customers want a quality build. not cheap plastic.